Apple iPad is one of the most popular tablet devices around, the design, operating system and the features of its, need more than just the device. When it comes to using the iPad, there is a host of accessories that will make using the tablet device even easier. Apple has released a number of accessories for the iPad, but there are also a number of companies that produce independent iPad projector, cover, and digital accessory options. Here are some of the best of the iPad accessories can be purchased either from Apple or from independent retailers. The Smart Cover is one of the best of the Apple accessories, and it automatically is shipped with each iPad or any other Apple iOS device. The cost of the smart cover is negligible if it needs to be replaced, but the cover itself is invaluable for protecting the iPad against dust, damage, and scratches. It makes it easy to read or watch videos on the iPad, as it folds up to make a handy reading stand. The smart cover costs from between $20 to $55 and the price change depends on the color and the manufacturer of the cover. 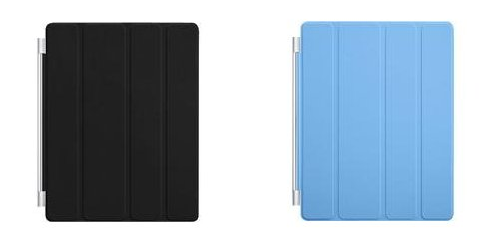 Buy the Black smart cover and Blue smart cover from Amazon. The Digital AV adapter is an excellent accessory that will make watching movies from the iPad on the TV much easier. The AV adapter simply plugs into the iPad and the TV, and the screen of the iPad is automatically projected onto the TV to make watching movies and playing games on the iPad just that much easier. The screen on the iPad 2 and the content on it, is exactly what is shown on the bigger screen when connected through the adapter. The adapter is available for a price of $37 on Amazon, you can buy it here. 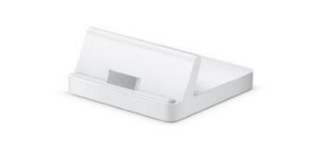 The iPad Dock is the perfect Apple device for those who like to have all of the information on their computer quickly accessible from their iPad. The dock instantly connects the iPad to the computer, and it charges the battery as well. Some docks even come with speakers, enabling iPad users to easily play their music out loud. The official iPad dock is available through Apple and the same can be used to charge the iPad and make the iPad sit on a stand, slanted. 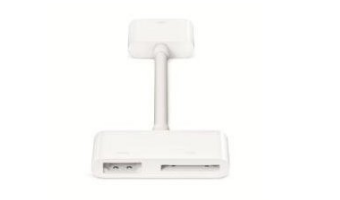 The dock can connect to iPad 10W USB Power Adapter to supply the charge to the iPad. It is available for a price of $10 on Amazon. The iPad Projector is one of the handiest devices to enjoy watching movies or playing games when on the go. The projector simply connects to the iPad, and the bright LED or LCD light of the projector displays the image of the iPad screen onto the nearest wall, roof, or flat surface. Those who enjoy watching videos, playing games, editing images, or surfing the internet on their iPad will find that the projector makes it even easier to do so. 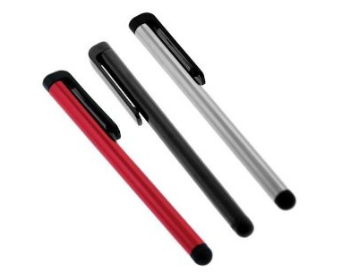 The Universal Touch Screen Stylus Pen is something that can replace the need of a finger touch always while you are using an iPad. The oily, or wet fingers do not give the same sensitivity always, thus the pen does a better job most of the time. The pens come in different colors like Red, Black and Silver and the pack of 3 pens costs around $1.45 at Amazon. The Ear bud style headphones make it easy to enjoy the music and movies on the iPad without distractions, as the ear buds eliminate the background noise from filtering into your ear. The Apple headphones are unnecessarily expensive, but there are dozens of companies that make high quality ear buds that will make listening to the sound of the iPad much more enjoyable. The Ear bud style headphones that are available on Amazon are priced at around $40 but are excellent with an aluminum casing and a travel case. Buy it from Amazon. Paul is a technology expert and an Apple geek, sharing all the information and sources for the best ipad accessories, including the ipad projector which is one of the most needed ones for the companies during business meets and presentations.